I absolutely love a good curry and to be completely honest, I’d easily eat it every day with no regrets. The ingredients are super easy to get your hands on for one and they won’t break the bank (a win win situation in my books!). I really want to start doing a few more international dishes on here, and I’ve reached out to a few of my friends to help me out on this one. What’s better than cooking with people who grew up with curry cooking or dahl stewing away? I have lots of idea up my sleeve, and I’ll leave it at that (gotta keep some stuff on the DL around here). Ok, I hope you guys enjoy this one and with that I am going to drop the recipe below. Please share your recreations with me on Insta, I love seeing them! Method: In a dutch oven over medium-low heat, add the coconut oil. Once melted, fry off the onion along with the garlic until soft (about 5 minutes). Next add in the carrots, broccoli, green beans, zucchini, and peas. Add the broth, coconut milk, and green curry paste. Allow the curry to simmer until the veggies have cooked through (approx. 20-30 minutes). 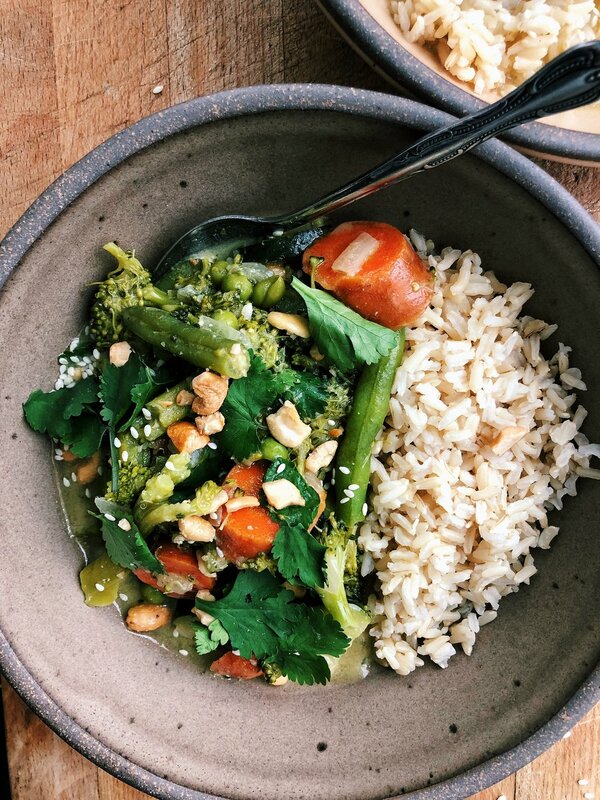 Serve over brown rice with cilantro and crushed cashews (optional).